This project is successfully supporting the transition of a semi-subsistence goat farm to a market-oriented farm. Within 5 years it aims to increase the number of goats from 85 to 200, to increase revenue and to reach and maintain EU standards. 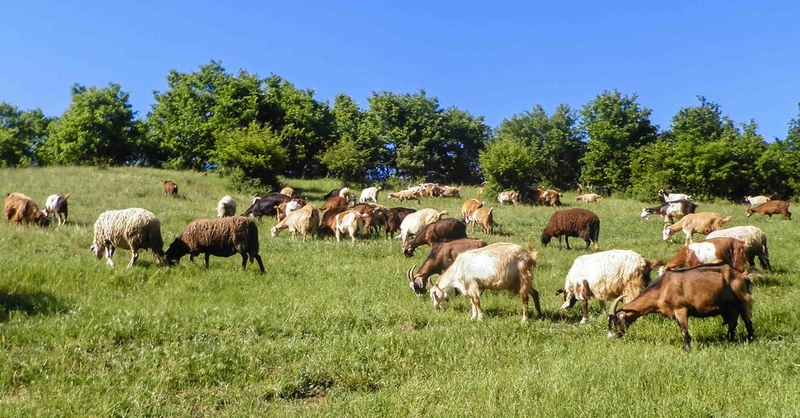 Marina Dicheva established her farm with 20 dairy sheep and 2 female goats in Alekovo in the region of Silistra in 2002. The farm began to focus solely on goat breeds in 2005 due to excellent conditions and the fact that, while goat breeding is a local tradition, few people now breed goats. The number of goats had increased to 85 female goats by 2012. Currently, the farm consists of 3 ha agricultural land with forage crops for feeding the animals and around 30 ha of rented pastures. Marina is the only worker at the farm, however, during some periods, a seasonal worker is hired. The farmer's main goal is to expand her small farm into a market-oriented and viable economic unit compliant with EU standards. To achieve this, the specific objectives are to: i) increase the number of female goats from 85 to 200; ii) increase milk & meat production; iii) reach and maintain the EU farm breeding standards, and; iv) improve the farmer’s skills and knowledge with training in livestock breeding and consultancy from the Extension agricultural service. Already, the goat milking on the farm is done mechanically. The main production is raw goat milk, which is now sold for processing based on a permanent contract with a processor producing dairy goat products. Throughout the entire 5 year period of the project, Marina Dicheva will continue to receive technical assistance and training in livestock breeding and advice on business related topics to assist her to turn her semi-subsistence farm into a sustainable business. EAFRD funding has already led to an increase in the number of goats, and the improvement of farm conditions and profits. The farm has reached the EU veterinary and sanitary standards, the standards for animal human treatment, environmental protection and safe labour conditions. Participating in training activities has led to an increase in confidence and motivation for Marina, a greater interest in participating in other RDP measures and a desire to be involved in professional communities. Marina Dicheva has this advice for others in her position: “To try on your own… to develop your farm because you believe the European funding is not accessible and you are afraid of the administrative process of applying is the wrong approach! Professional help and assistance can be available providing the farmer is clear what are their goals [sic]”. Although still on going, this project has shown that even a small amount of funding can allow a small business to grow and improve substantially. The farm is located in the village of Alekovo, Alfatar Municipality, in the region of Silistra. The owner of the farm, the 40-year old Marina Dicheva graduated in a foreign language high school. After graduating she worked in the service industry (as a waiter, salesperson) then moved to Spain and worked in a vegetable greenhouse farm.